It's unfortunate that before its launch Resident Evil 5 became about everything, but the game. The most hotly debated questions had little to do with what should matter most to gamers: Is it fun? In Resident Evil 5, Chris Redfield returns, no longer a member of STARS, but as a member of the Bioterrorism Security Assessment Alliance, traveling to the fictional African nation of Kijuju to investigate the origins of the zombifying virus. With wide-open settings and a partner in tow, can this latest iteration stay the horror survival course and deliver a fun and frightening experience? Graphics: Visually, this is one of the most stunning games I've played to date. It's not just that the graphics are so high-resolution, so painstakingly detailed, but that they paint a vivid image of a real world setting. More impressive still are the cut-scenes which play like movies, beefing up the already laudable visual fidelity of the game. Codependency: Resident Evil 5's use of a partner makes everything more tense. You suddenly feel responsible not just for your own survival but your partner's. You need to heal her when she's down, call for help when you get pinned, trade weapons, ammo, everything. It adds extra edge to an already sharp experience. Early Tension: Initially I was disappointed to find that the game seems to lack any big scares. No dog-through-the-window moments that so ingrained the first title in my memories. But as I played through the game, I came to realize that those haunted house moments are cheap scares. Instead Capcom takes a more adult, more sophisticated approach to delivering thrills. And while it lasts, for about the first half of the game, it is indeed thrilling. Interactive Cut Scenes: There are several times in the game when the highly-polished, gripping cut-scenes become interactive battles. These battles tightly weave together the artistry of one and the action-button mashing of the other to create some of the game's most memorable moments. Boss Fights: What I like best about this game's boss battles is that they're so diverse. Spread through the game's six chapters are enemies functioning as cleverly disguised puzzles, enormous, awe-inspiring creatures requiring wearing down and, in my favorite, a culminating battle worthy of the franchise. Level Design: Often, survival horror games rely too heavily on the obvious settings: darkened rooms, empty homes, abandoned hospitals. While those locations help tap into the natural fears of gamers, they also lead to generic scares than are more reactive than psychological. Resident Evil 5 delivers its suspense and scares across a broad range of settings which, while perhaps push the game too far away from its roots, still provides an eclectic mix of tightly constructed levels. Cooperative: While online cooperative Resident Evil 5 can have the occasional hiccup, the ability to drop into a game, either online or on the same couch, makes this a fun and occasionally frightening group experience. Less Tomb Raider, More Silent Hill: About halfway through the game, Resident Evil 5 seems to undergo a sudden and dramatic metamorphosis, dropping all pretense of being a survival horror title and unmasking itself as an action shooter title. There are moments this late into the game that feel more like a solid, enjoyable Tomb Raider or Uncharted: Drake's Fortune style experience than the horror action many fans will be expecting. Drop the Anchor: I've grown to accept, perhaps embrace, the fact that you can't move once you aim a firearm in Resident Evil 5. I know it sticks to the game's history—and, more importantly, police and military often lock into position before firing off a few rounds. So I'm OK with that. But knife fights? Knife fights are fluid things that are often more about positioning and movement than the cutting motion. Unfortunately, in Resident Evil 5 these potentially strategic melee moments turn into zombie piñata, with gamers patiently waiting for a bad guy to walk into their cutting radius. The situation, not the controls should be the thing rooting you to one spot. Load Screens: The loading screens, especially early on in the game, are plentiful. Sometimes they make you sit about reading Resident Evil history for as long as you end up playing before hitting another load point. The issue seems to go away as the game progresses, but it never completely leaves the game. Resident Evil 5 is a game straddling two genres, the obvious and mostly successful attempt by Capcom to make the title once more relevant to a broader and more mainstream audience. Judging by Resident Evil 5, I think the next iteration will be more like Uncharted than Silent Hill. While that could be a disappointment for some, I think that if handled properly a genuinely scary adventure game could be better than a horror survival title that squeezes out shallow, undeserving frights. As it stands, Resident Evil 5 is a game that slowly winds the tension up from section beginning to end, missing several obvious and easy opportunities to be genuinely scary, instead opting for a persistent and growing feeling of suspense, one that seems to be approaching dread but never actually arrives. It's this wait for a second shoe to drop that wears at the gamer and deliver a fear much more robust and meaningful than what has come before in survival horror games. It's unfortunate that that shoe never drops and instead the game retreats into action and shooting to wrap up what could have been an exceptional thriller. Despite my qualms and hand-wringing over what type of game Resident Evil 5 is, one thing is clear, it's fun. From beginning to end, this latest Resident Evil delivers a riveting and intense experience well worth the time spent playing it. 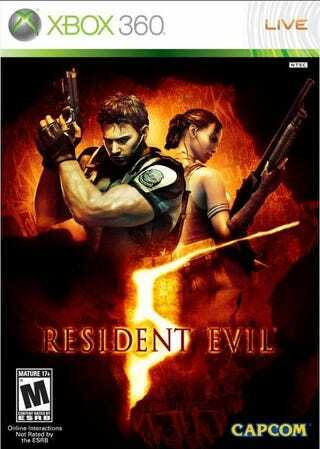 Resident Evil 5 was developed and published by Capcom for the Playstation 3 and Xbox 360 and released on March 13. Retails for $59.95 USD. Played campaign to completion on Xbox 360 tested online coop mode on Playstation 3.